The Ultimate Guide To Become Location Independent is your one-stop guide to help you create a lifestyle of nomadic entrepreneurship by following your passion. Whether it is long-term travel, creating an extra income through passion projects, or simply having the freedom to settle anywhere in the world while still making a living, this guide will teach you everything you need to know to make it happen. 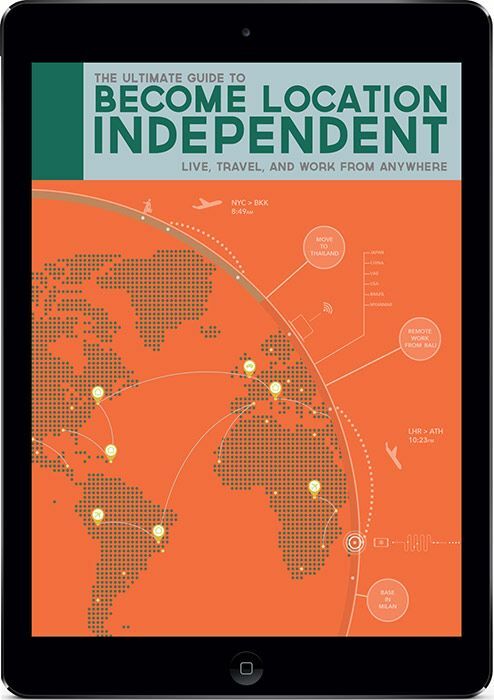 The eBook is organized in a simple, easy to follow format that will guide you from understanding what location independent is to the execution of this lifestyle. It is also designed to inspire you by sharing the tips, strategies, and stories that helped me become location independent and travel with a small budget to over 87 countries in the past three years. - How to introduce yourself to a location independent lifestyle. - The basics to become an online entrepreneur, including several ways in which you could make a living abroad. - How to minimize the risks of taking this lifestyle. - How to manage your timebetween business and travel. - How to travel and live abroad for less money than what you spend at home. - How to manage your finances on the road, even if you have debt. - Methods to evaluate the cost of living and travelingaround the world. - Travel Hacking tips to help you fly and find accommodation at a fraction of the cost or even for free! - Ways to discover free or cheap deals in the area you are visiting. - An in-depth resource list to keep you on top of everything needed to plan your trip around the world. Take action to realize your dreams and stop fearing what could be ahead if you take the leap.